^ Same here, I watched the trailed and her accent was dreadful...although I sorta wanted to see Greg Kinnear as JFK. I just finished "Jackie as Editor" by Greg Lawrence (book posted on previous page) and I must say it was very interesting. As a writer, I kept thinking to myself "I wish Jackie was my editor" because she cared about the words and the writer (not so with a majority of editors, in my experience). Reading JAckie as Editor now, it's a really interesting book! I haven't acquired "Jackie as Editor," but I do have "Reading Jackie." It's interesting, but not up to par for a book supposedly by a professor (a freshman could have written a more polished book!). However, I love the pics of her that are included. I always forgot how sensible and toned down her wardrobe became in later years, and it's refeshing to see those types of pictures. ^ Thanks a lot for the scans! Wonderful pictures. This thread has been dead awhile. I just finished scrolling through it and I loved once again seeing how her style evolved from regal queen to effortlessly hip to summery casual, but always looking amazing during every stage of her life. Okay, so I have a request. 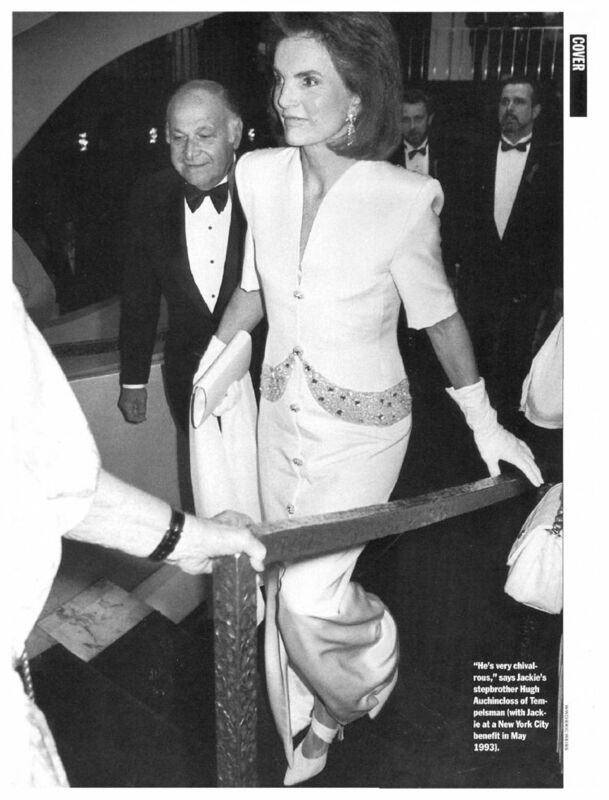 Circa 1993-1994, Jackie wore a Caroline Herrera ivory white evening "shirt" dress, with an embroidered "belt" and paste gold buttons. I first saw a picture of it in Jackie Style but haven't seen any of pics of Jackie in it online or in other fashion books on her. I think she looked really beautiful, but I can't locate pictures of her Anywhere wearing it. Anyway, here are some pics that haven't been posted on thread (or are there, but aren't in colour). Credit to ibtimes.com and brownpaperpackagestiedupwithstrings.blogspot.com and the JFKlibrary.org site. I'd love to know which Persol's those are above. Credits from brownpaperpackagestiedupwithstrings.blogspot.com, JFK Library and ibtimes.com. I'm also reading Jacqueline Kennedy: The White Years and am convinced the only reason Bowles isn't his zippy, witty self is because the Kennedy family put pressure on him to put Jackie on a pedestal. He normally doesn't come across as show-offy in his writing, but it's annoying here. I love the catalogue for the pictures and designer information, but the "Jackie was such a saint in how she wore clothing" (not to mention the endless repitetion of cetain details about Jackie's clothing style or designers) is driving me crazy. Hamish manages to make Jay Mulvaney seem rather scholarly (which is quite a feat, given that JM is such a Kennedy fanboy). wild roses, is this the dress you're looking for? YES! And I'm sending karma your way! Somehow she managed to manage a gown that could be kitsch--a shirtdress as evening wear--and make it elegant and regal.